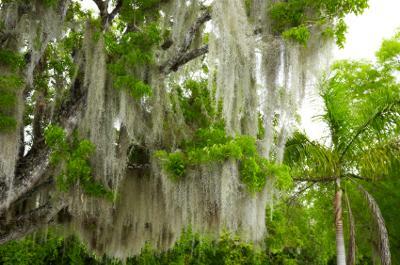 Spanish Moss growing on a hardwood tree. I like to use Spanish moss of many colors to make my trees. You can use it right out of the bag by pulling the moss apart and cutting it to size so that it drapes over the tree branch form and attach with a 4:1 mixture of Elmer's Glue All. The form can be made from dark brown pipe cleaners. Also, you can run your Spanish moss through a food processor to reduce it to smaller sizes and then drape the finished product over the pipe cleaners with a 4:1 mixture of Elmer's Glue All. Also, go to your local Hobby Lobby and look through their artificial flower selection. Some of the grasses and budding florals can be used as trees when cut to specific lengths. Use your imagination. Some even look like bushes and can be integrated with Spanish moss or lichen to create trees and shrubs. Thanks for the tip. Like you, I've found that organic materials translate well into model railroad diorama construction.